Zika Response Pinches Health Department Budgets : Shots - Health News The extended debate in Congress over emergency funding for a response to the Zika virus is forcing public health departments to cut existing prevention and treatment programs. 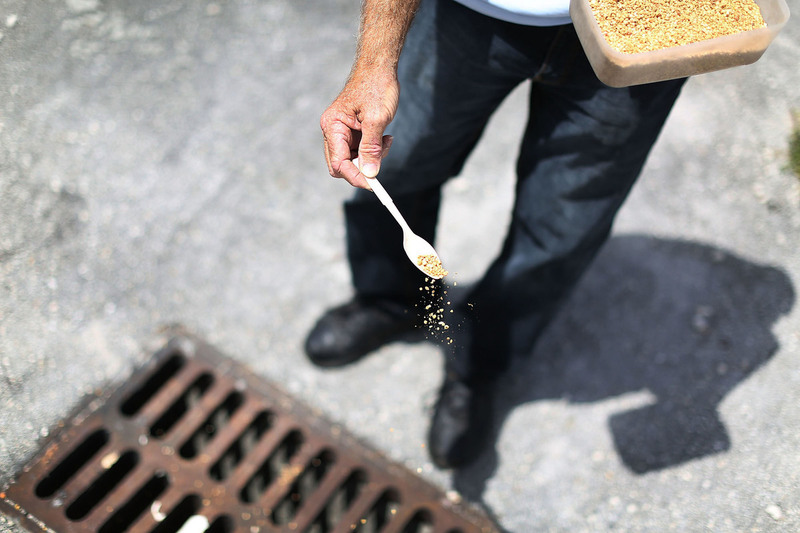 A mosquito control inspector sprinkles larvicide in a storm drain in Miami Gardens, Fla., in an effort to stop the spread of Zika virus. While Congress fidgets over whether and how to pay for the fight against the Zika virus, state and local health departments are scrambling and slimming down. That's because these front-line public health agencies have already seen their budgets chopped because of the debate. The Centers for Disease Control and Prevention in April cut $44 million from its fund that helps state and local governments prepare for public health emergencies. It was part of the $589 million the White House moved from other programs — mostly money allocated for domestic and international responses to the Ebola virus — to combat Zika as it awaited action on Capitol Hill. New York City's health department lost $1.1 million in the deal. Marisa Raphael, the deputy commissioner in New York's Office of Emergency Preparedness and Response, says she expects to have to cut jobs. "We depend on this grant to create an infrastructure for our preparedness and our response," Raphael tells Shots. "That's everything from our lab staff to our surveillance staff, so when we have this cut, that does immediately impact our capabilities." New York isn't unique. A survey of state and local health departments shows that many are struggling with the reduced funding. About a third of state health departments say they expect to lay people off, and the same number say they'll likely eliminate training programs. The cuts will affect the kinds of things these departments normally do. "A new measles outbreak? That's the job of the health department to discover and to control," says Thomas Inglesby, the CEO of the Center for Health Safety at the University of Pittsburgh Medical Center. "Or a new mumps outbreak on a college campus, or a meningitis outbreak. That's the day-in, day-out work of public health." He says public health department budgets have been slashed over the past 10 years and they just don't have excess resources or people that can be cut. "If you take funding from local health department preparedness that means people are fired or labs can't run the same way or disease surveillance has to stop," he says. "If we take people from those jobs to work on Zika, that will help with Zika, but that will hurt our other preparedness efforts." President Obama in February made an emergency request of $1.9 billion to combat the Zika virus. The money would be used for research into a new vaccine, treatments and tests for the disease as well as to study and track how it spreads and try to control the population of mosquitoes that carry the virus. Scientists agree that the Zika virus is linked to microcephaly, a condition in which babies are born with undersized brains and skulls. It is also linked to several other types of birth defects, and to Guillain-Barre syndrome in adults. The House of Representatives this week passed a bill allocating $622 million for Zika response, about a third of the president's request. And all of the money comes from other programs. House Appropriations Committee Chairman Hal Rogers, R-Ky., argued at a recent markup that the emergency money was a stopgap until Congress could allocate more money as part of the regular budget process. The Senate is working on a separate bill that would provide $1.1 billion in new money for the disease. Public health experts argue that three months is a long time to wait for what many say is an impending public health emergency. And since Zika is just the latest in a string of infectious disease threats, many public health experts want to create a standing fund for public health emergencies. Such a fund could operate like the one maintained by the Federal Emergency Management Agency. The agency can draw on it as needed in an emergency; it would be replenished in the regular government budgeting process. Anthony Fauci, the director of the National Institute for Allergies and Infectious Diseases, part of the National Institutes of Health, and Thomas Frieden, the director of the CDC, advocated for such a fund in recent weeks. "The whole idea is to have funding available urgently when it is needed urgently," says Melinda Moore, associate director of the Population Health Program at the Rand Corp.
She says FEMA money is "available as soon as it's needed, right on the heels of a hurricane, a tornado, et cetera. Some of these outbreaks — and Zika is a good example — are nearly as urgent as that." Inglesby agrees that an emergency fund would eliminate these repeated budget fights. But for Zika that debate is too late, he says. Congress should allocate emergency money for Zika now and then treat is as a regular part of our public health landscape. "Zika is the new normal," Inglesby says. "Zika is something we're going to have to deal with not just this summer, but next summer and the summer after that."